The internet pictures of shimmering inks are like the Vampires in the Twilight saga - they sparkle brightly! My own experience is more along the lines of a traditional vampire movie - the sparkle turns to dust in the light! Perhaps it is because I use narrower nibs and don’t lay down enough ink to show the shimmer? Or maybe because I don’t always write on Tomoe River paper. Or perhaps even because I don’t usually drip spots of ink onto a page. Either way, even without the sparkle, I do enjoy the colours of base inks. J. Herbin’s Emerald of Chivor is a stunning green and one of my favourites, even without the shimmer. J. Herbin has released an annual new shimmering ink in their 1670 line. These inks are branded with white cardboard boxes highlighting the year the company started producing inks. The colours tend to be brighter and more vibrant than the traditional J. Herbin inks and command a higher price (usually in the $35 range). The inks have a gold shimmer pigment. 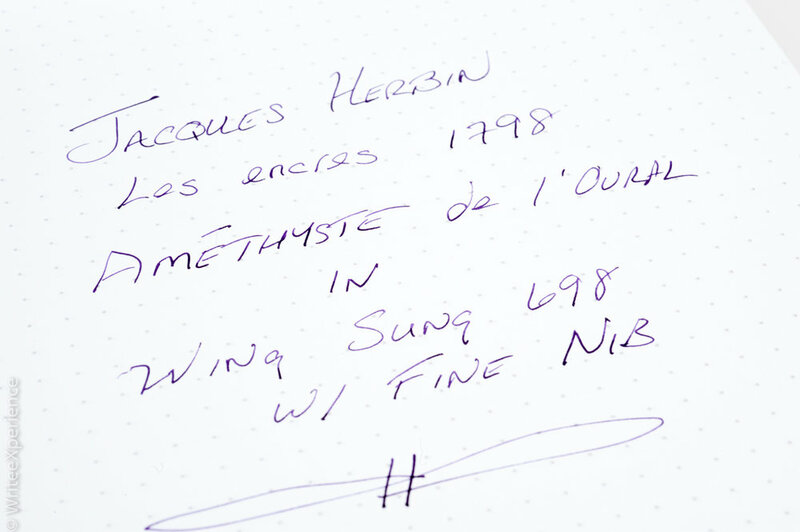 J. Herbin is in the process of rebranding this line and released the 1798 Amythyste de l’Oural ink in a similar bottle, but a grey box, as Jacques Herbin, which is the first time I ever found out what the J. stood for. The 1798 ink is very similar to the old 1670 line, except that the shimmering pigment is now silver. Personally, I am not sure that the change in pigment is worth the development of a new brand, especially given the success of previous inks. I have had this ink for a few weeks and put it in a new pen that came in the mail at the same time- a Wing Sung 698. The Wing Sung is a fine nib and also a demonstrator (transparent body) pen, and I realize this is the first time that I have ever put a shimmering ink into a demonstrator pen. After using it on my desk for a couple of weeks, I can report real-world findings. The ink colour is lovely. A rich dark purple, with a faint shimmer. When freshly agitated, the ink looks fantastic with the shimmer swirling within the pen. It lays down well, though perhaps a bit darker than I would have expected. Dry time is good, and the ink behaves well on the page. I shot some larger samples on Tomoe River paper, and with a much wetter and larger ink sample, the shimmer was fantastic. But, the shimmer settles very quickly. Too quickly. With the clear bodied pen, I can see the ink settle at the bottom of the barrel. To give you an example of how fast, I was journalling a page in a Rhodia A5 webnotebook and realized that the pigment had settled against the feed after only half a page of continuous writing! This settlement was much quicker than expected and means that you need to agitate the pen regularly when writing. I stress agitate the pen and not shake it unless you really want to make ink droplet samples on your paper. Ask me how I figured this out…..
Amethyste de l’Oural is ink you will need to use on a regular basis. I can see the pigment settle in the feed and barrel after leaving my pen on my desk for an hour. I have used this ink every day, and still feel that the feed of a fountain pen could get plugged from the shimmer if left too long. I don’t think this would cause any long term damage as it should be easy to clean, but because of this, I would not recommend filling in a piston fill or vacuum fill fountain pen or other pen that may be difficult to take apart to clean. Despite the tendency for the shimmer pigment to settle quickly, I do recommend this ink. The purple is vibrant and bright, even without the sparkle and it is a nice ink to use. If you can write with broad nibs, I am sure you will be even happier!